Day 4 of dashboard week started and Steve walks in telling us to work on our CV’s (I was probably one of two people who hadn’t started yet), so I spent basically until 3:30pm working on it. On a sidenote, I’m really happy with how it turned out. However, it meant I had very little time to work on today’s dashboard. 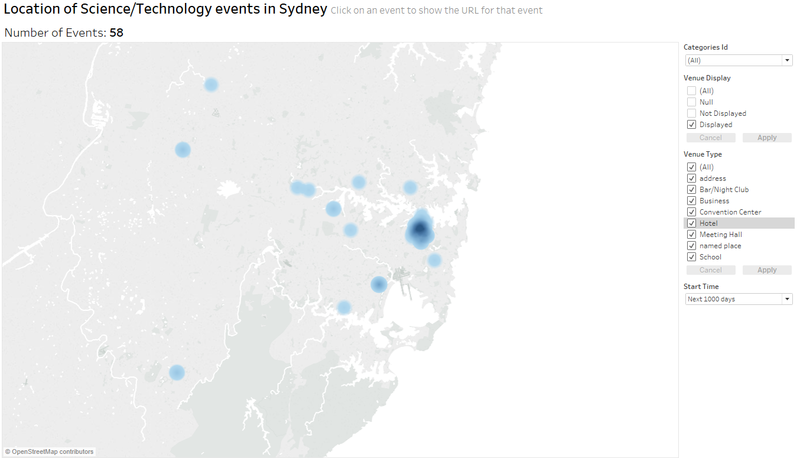 We were given an API for Eventful – a site with information on a myriad of events happening globally. I didn’t have enough time to fully explore the endpoints, so I just went for the basic API that told me information on events. 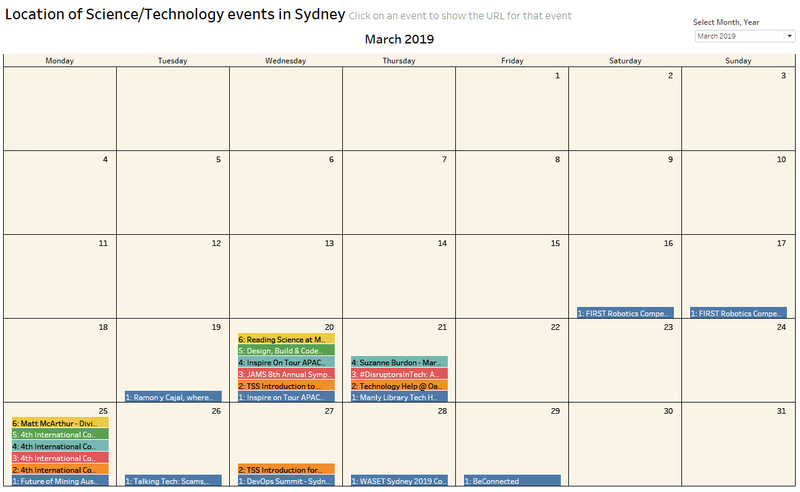 I decided to focus on the category element of the API and looked at science/technology events happening within Sydney. I chose this as it’s reflective of events that I’d be interested in going to. To my disappointment there were only 73 matches – not a whole lot considering the previous datasets we were working on this week. I had to roll with the punches though. The most obvious thing for me to do was put it all in a spatial with a few filters added on top. It looked quite bare and I wasn’t very impressed with it. Friday came and Craig announced that he’ll be giving us Friday’s dataset and that we could present both Thursday/Friday’s work at 3pm. So now I have 6 hours to both polish the Eventful workbook and work on the new dataset. As a result I spend Friday working between the two of them. I quickly knocked off Friday’s dashboard and came back to this one to work on it more. I saw that Neal worked on a yearly calendar that showed the number of events. I thought it was a really good idea so I decided to go for a variation and create a monthly calendar with days as the level of granularity. I read a few blogs on how to do a calendar. I did a rough prototype and presented my work at the end of the day. I still wasn’t happy with it so I spend a bit of the weekend working on completely polishing it. I had to generate every single day on Excel so that I didn’t have missing dates. This allowed me to have a date for every day on the calendar instead of just the ones with an existing event. The second breakthrough was ordering the events so that the colouring was consistent for the event number of the day. I had to sort the data in Alteryx by Start Time and then alphabetically by ID to achieve this. It still required a bit of trial and error with the table calculations to get it just right. Since I created a lot of dates on Excel, I wanted to filter the months that exist past the last date of the maximum Eventful date. Now it’s looking close to perfect. The title’s were too long to fit on each bar so I created a shortened title and put that on label instead. I’m super proud with how it turned out. It required a lot of modifications but worked out in the end. The only thing I could have figured out but decided to settle on was the null value in the dropdown box for the MY filter. It is something I could work on in the future but as a proof of concept, I’m happy with the output.